Retired U.S. Navy Adm. Mike Mullen (left), the former highest-ranking officer in the U.S. Armed Forces as chairman of the Joint Chiefs of Staff, received the 2010 United States Sports Academy Theodore Roosevelt Meritorious Achievement Award during the Navy football game against Troy, an Alabama university, on Saturday, Nov. 5, 2011. 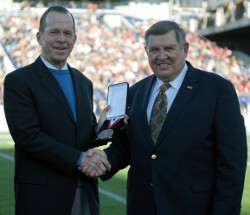 Presenting the Roosevelt award to Mullen is Jack Lengyel (right), an Academy Board of Trustees emeritus, who is the former athletic director at the United States Naval Academy. Retired U.S. Navy Adm. Mike Mullen, the former Chairman of the Joint Chiefs of Staff, received the 2010 United States Sports Academy Theodore Roosevelt Meritorious Achievement Award during the Navy football game against Troy, an Alabama university, on Saturday, Nov. 5. Mullen, who retired from the Navy in September after 43 years of service, earned the Roosevelt Award for his leadership in the military and his support of those injured in combat, through programs such as the Warrior Games. The Warrior Games is a joint effort between the U.S. Olympic Committee and the Defense Department. It is a nine-sport festival for those wounded in military combat. The inaugural games in 2010 drew 200 military athletes competing in nine different sports. The Academy’s Theodore Roosevelt Meritorious Achievement Award is presented annually to an individual involved in amateur or professional sport, past or present, who has excelled as a contributor, not necessarily on the playing field, to both sport and society for more than a decade. As the 17th Chairman of the Joint Chiefs of Staff, Mullen was the highest-ranking officer in the U.S. Armed Forces between October 2007 and September 2011. He lauds the Warrior Games for inspiring American service men and women who were injured in combat. During his term as the nation’s top military officer, Mullen was influential in ensuring the troops in Afghanistan received the resources they needed, pushing for a troop surge, working to improve America’s relations with Pakistan and supporting the repeal of the military’s ban on gays serving openly.